Use our printable writing tools as helpful guides during your writing lessons. 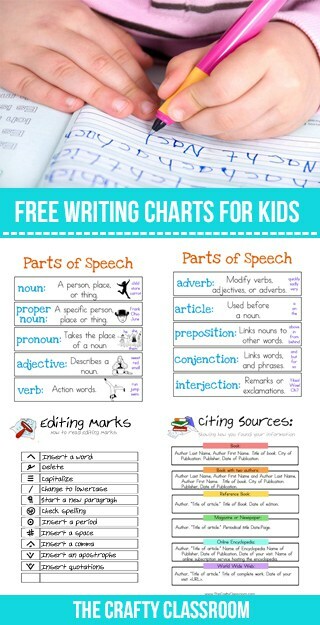 These sheets are great to store in your writing notebook or as a stand alone resource for learning about different parts of speech, writing transitions, citing sources, and common editing marks. These writing printables are also included in our Writing Guides for children. All of our premium resources are developed with educational independence in mind, and can be purchased in downloadable format from our eStore. This is a two page set covering ten different parts of speech. These would be great laminated back to back or put into a page protector sheet and included in the front of your writing notebook. This is a printable chart of the different editing marks that are used when revising a paper. I recommend printing this on cardstock and placing this in the back sleeve of the binder. This is a printable sheet for children to keep in their notebooks as a handy reference. There are quite a few different ideas for transitions they can use to connect their writing into sentences that flow smoothly. This is a printable sheet for children to keep in their notebooks as a handy reference for citing sources. We also found this helpful worksheet online for large amounts of sources. I printed them on both sides and keep a few in our notebook. Make a colorful binder cover or print our pre-made covers and have children write their name in. You can also use this space to display your children’s artwork, or projects they have done well on.